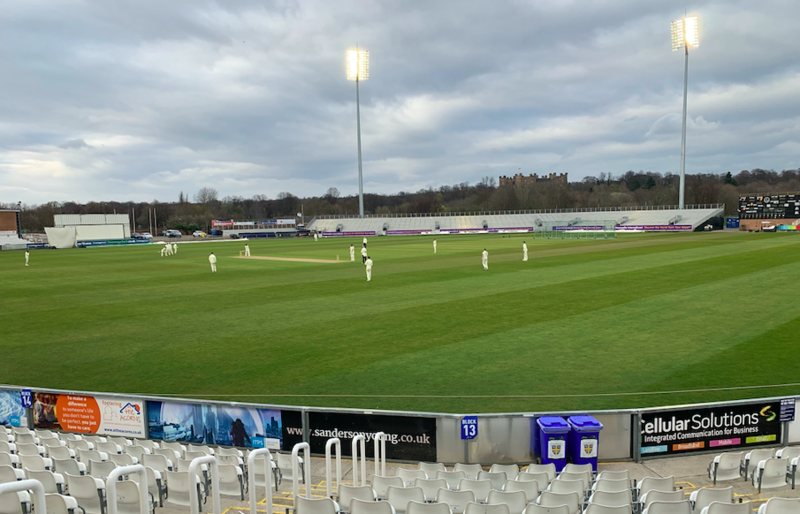 Durham's opener to the first class season was a successful one as they beat Durham MCCU by 296 runs. The new look Durham Cricket flew out the blocks to see off the challenge of Durham MCCU. The hosts had taken an early advantage through Will Smith's remarkable 179, the bowlers then took control as Ben Raine and Chris Rushworth blew away the MCCU's batting line up. The Durham batsmen then looked in good touch again as Gareth Harte notched up his first hundred of the season, ably assisted by the aggressive Stuart Poynter to set the students a final day target of 502. A sharp spell from Rushworth and Raine in the afternoon combined with Ryan Pringle's hoovering up of the tail to give Durham a 296 run win. For Durham's batsmen, it was an extremely positive scorecard to look back on. Smith made his eighteenth first-class century on his way to 179 in the first innings. His controlled knock looked to have all the hallmarks of a man in a rich vein of form. In the second innings, it was Harte's turn to take the headlines. His methodical but positive 108 allowed Durham to really push home their first innings advantage and reach a declaration total in good time. It wasn't just the two centurions in the runs, however. In the first innings, it was opener Alex Lees who played a vital role in giving Smith the support he needed, their strong partnership on day one setting the tone for the game to come. It was Poynter's turn to play the supporting role in the second innings although in a very different manner. Poynter's attacking intent drove Durham's scoring rate up while allowing Harte to settle at the other end, the Irishman's 80 from just 57 balls the perfect knock for the situation. With the batsmen finding their form it was then up to the bowlers to give them the support that they needed. Raine and Rushworth certainly gave them that with Raine's 4-30 and Rushworth's 3-9 in the first innings removing that spine of the MCCU order with George Harding and Josh Coughlin chipping in with vital wickets. It was the Raine and Rushworth show again in the second innings as the pair took five wickets between them before Pringle found his form to take the last two wickets. Whilst this may have just been a warm-up for the season against the local students, it will have inspired some confidence in the Durham line-up. This could be a very big season for Durham as they look to have a fresh start and even make a push to promotion back to Division One. Therefore seeing the batting and bowling units putting on such good show in their first run out should be able to really give a relatively young and inexperienced dressing room the lift it needs to start the season strongly.